This is the time when YOU begin to have a hand in running things. Venturer Units are run by their Unit Council, and 145/37 Foresters are no different. While Cubs and Scouts have largely been run and organised by their adult leaders, the reins are handed over to the youth members in Venturer Units. Don’t worry, you’ll have lots of help from your leaders and the older Venturers along the way. In time you’ll become the one of the people other Venturers turn to. Venturers are part of the biggest and most successful youth organisation in Australia – Scouts Australia – with thousands of young people enjoying an almost unlimited range of activities. And there’s always room for more! As a Venturer you get to take risk to the next level. Instead of walking into caves, you’ll get to abseil into them! Instead of camping in a tent, you’ll get the opportunity to build an igloo and camp out in that! You’ll also have opportunities to attend training courses and gain nationally recognised certification. You’ll go on camps with a few friends or join hundreds of other Venturers for an awesome adventure at a state level gathering such as Vic Gathering or Anything Goes, and once every three years join thousands of Venturers at Australian Venture. The possibilities are endless. Your confidence will continue to grow and you’ll learn how to make decisions and manage a unit as part of a team. If you were a Scout, Venturers will be the continuation of your journey. If you’re joining the movement for the first time, you’ll have some amazing times and even learn something on your journey. The Venturer Award scheme has something for everybody. From the Venturing Skills Award to the Queens Scout Award – the highest award a Venturer can achieve. It also carries an outstanding reputation within Scouting and the wider community. 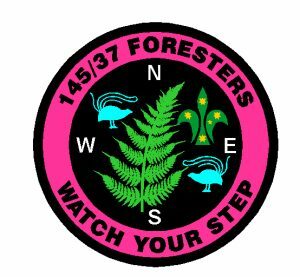 145/37 Foresters are a unit within the Sherbrooke Forest District, within the Mt Dandenong Region in Victoria. 145/37 is a reference to the latitude and longitude of the area while Foresters describes the area to which we identify. Our members are drawn from the Dandenong Ranges from places such as Upwey, Tecoma, Belgrave, Ferny Creek, Monbulk, Kallista, Selby and more. It doesn’t matter where you live or which (if any) Scout troop you came from – Foresters will welcome you aboard. Venturing is fun and challenging. You’ll make lasting friendships and learn things about yourself while becoming responsible for your own actions and progress. Your achievements will lay a foundation for your future.